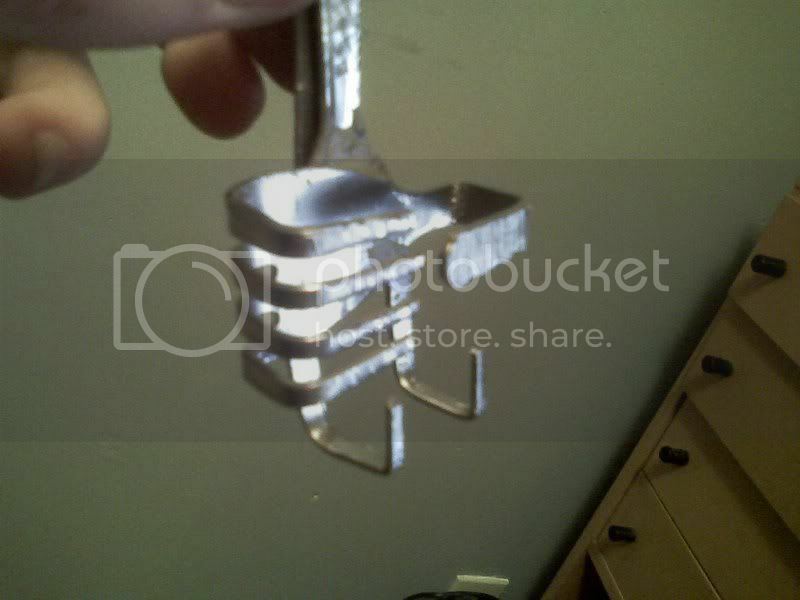 I saw this on posted on the Zippoclick forums that a member had acquired. I decided to make one for my own. It's a sturdy holder to carry a Zippo lighter; it is an alternative to the Z-clip, in which the lighter does not accidentally fall out. Also unlike the leather holder by Zippo, you can be proud to show off the design of your lighter. Find a hard area. Take your forks and hammer them completely flat, one at a time. Make sure they are completely flat as you can get them. Place one fork on top of another and hammer the middle to mate the surfaces, (see diagram) mark the surfaces with the marker. One fork will form the thumb and fingers of the holder (sideways), while the other will hold the lighter vertical. To form the thumb and fingers take your lighter and position it on the top fork to get an idea where to bend. Now be careful you only get one good bend or the fingers will break off. Anticipate the bend so give a mm or so OUTSIDE the anticipated bend. Bend the fingers one at a time; try to make it look even. Then with the Zippo still on the fork bend the fingers carefully around the lighter. Repeat for the thumb. The thumb is what governs how tight we make the lighter. Not the fingers since they break easily. 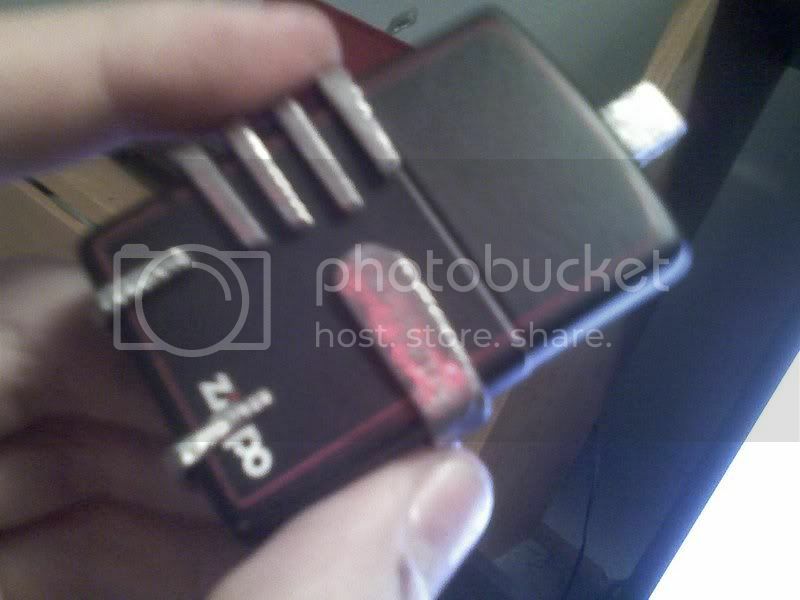 Also since the thickness of a Zippo can vary you need to adjust for this for EACH Zippo, or you might scratch the case. Use ether a Dremel or just bend back and forth until it breaks off. Slide the fork and adjust the thumb for tension of the lighter. For the second fork the fingers will hold the fork and the tail will clip onto the pants or belt. Set the assembly from step 2 onto the second fork. Mark the best spot to bend the fingers. Again give a mm outside the anticipated bend. Don't worry about the middle two fingers; we will break them off later. Form the fingers to the lighter like in step 2. Leave the tail straight for now. Wear gloves and mix a small amount of epoxy together (about the size of a U.S. quarter). Remove the lighter from the fork and dry assemble. Apply the epoxy to the inside of the mating surfaces of the forks, and mash the two forks together. Shape the epoxy around with your fingers and smooth it out. Don't remove too much epoxy because that's what holds the forks together. Set it aside to dry and cure based on the following times on the package. The epoxy is a lot softer than metal and any excess or rough epoxy can be sanded down later once it is dried. To finish bend the tail down to form the clip. Clip it to your pants/belt and decide if you need to cut down the tail some. It might poke in your leg when you drive or ride your bike. Based on the design this only rubs the lighter along the edges, but if you're worried about scratching the lighter then you can dip the whole assembly (minus the lighter) into plasti-dip to protect the finish of the lighter, adjust the thumb some to allow for the extra thickness of the coating. You can polish it up or add fancy detail with a dremel. If your going to coat it then leave it rough. I built several about 2 years ago and I still wear it occasionally but it still holds up. I get comments on it everywhere I go. I'm known for fixing things with forks, I fixed the door handle on my niece's car with a fork. If only I had two old forks to terorrize. Everything is too nice. 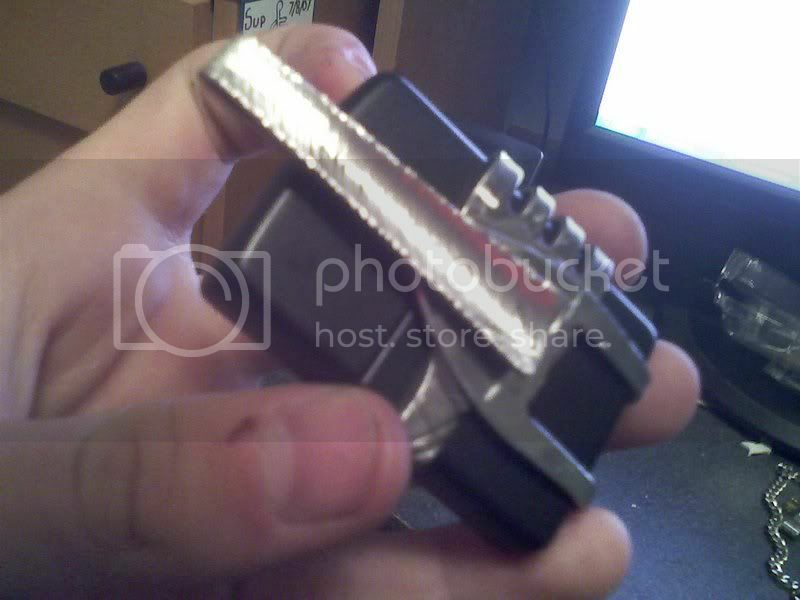 I took an old humbucker guitar pickup I had, and a tremolo spring, and a few bendings, and less than 5 minute zippo clip. It's magnetic, too. So nothing covers the zippo. :) Won't move, really, but it scratches the finish, not that I care. I paid 3 bucks for my rip-off brand that works really well. I then proceeded to scrath the shock symbol, used on Marilyn Manson's Antichrist Superstar album, carefully and neatly into the face. It looks really nice. Copper symbol, black background. Great idea, Thanks for this! I made myself a case for my Zippo out of..... Wait for it...... Wait for it...... That's right, DUCT TAPE!!!!! Come to think of it, i've made a Whole bunch of cases for a whole bunch of stuff out of duct tape.... Ipod Cases, Footbag Cases, Cell Phone Cases, not to mention a wallet.... The list goes on.... Have Fun!!!!! a welder would be nice, epoxy is something you can do indoors without burning holes in the carpet. Does it scratch the lighter? it can if you have the prongs too tight, its more for your everyday lighter than a prized collectable.